How big is that museum? Historic Buildings: In or Out of the Surveys? Galleries without collection: in or out of the surveys? Surveying museums: What’s in and what’s out? The Smallest Museum in the UK? Participate in our web application evaluation sessions! 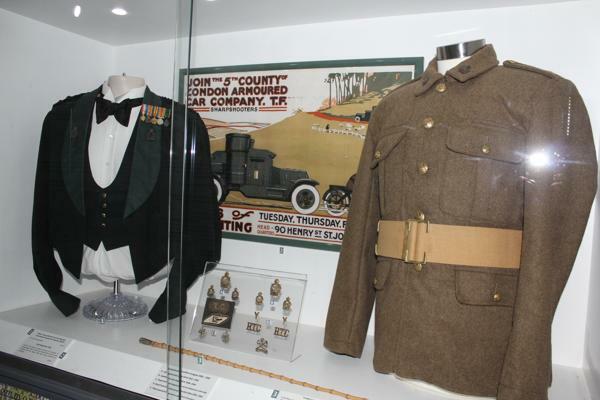 The museum is dedicated to displaying uniform, medals, weapons, armoured vehicles, models and memorabilia relating to the Kent and Sharpshooters Yeomanry Regiment (the Kent Yeomanry were formed in 1794 and the Sharpshooters were formed in London in 1900. They amalgamated in 1961 and their squadrons are a part of the Territorial Army, currently based at Croydon and Bexleyheath). The museum is situated in the extensive grounds of Hever Castle in Kent. From the outside it has the appearance of an army field camp, with two hall-sized khaki tents, a flag pole and an armoured car and field gun on display immediately outside; perhaps something of a surprise to visitors to the picturesque castle once owned by the Boleyn family. The tents cover much more permanent structures; one is an education room and the other contains a professionally designed and curated display space. Inside the displays are chronologically organised, starting with the formation of the Yeomanry for the expected French invasion in 1794 and covering 200 years of regimental history up to the recent present (the squadrons have served in both Iraq and Afghanistan). This includes Gallipoli and the Great War (along with a life-sized recreation of a trench with sound and visual effects), World War II (which includes a hands-on recreation of a tank turret) and more recent conflicts. A registry section includes a list of all members of the regiment who were lost in action and a medal chest containing drawers of military medals donated by families. The museum is generally unstaffed and the displays have been designed accordingly. The Museum was formed to preserve and display the property of the regiment, at the time of a regimental re-organisation. The museum opened to the public in 1966 at Squerrye’s Court in Westerham where it had a room for public display, given by the owner who was a serving member of the regiment. In 1985 It moved to historic property nearby, Hever Castle, and was similarly housed in a room above the keep. 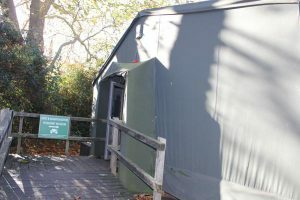 The Castle eventually paid for the construction of the new buildings in the grounds and the museum moved in 2015 after a £275,000 fundraising campaign for the interior fit-out by the Kent and Sharpshooters Yeomanry Museum Trust. Photo and text by Dr Toby Butler.